Registration is required for all courses. To register, call the Elmore County EMA at 334-567-6451. 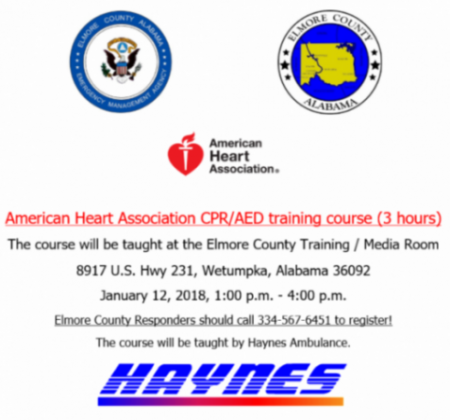 Please call Elmore County EMA at 334-567-6451 to register. Seats are limited. EMA hosts an AHA CPR/AED Training Course six times per year (one course every other month). 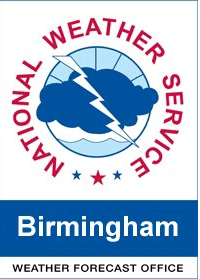 Call the Elmore County EMA at 334-567-6451 to find out when the next training course will be conducted. This is a three (3) hour course. Registration is required. 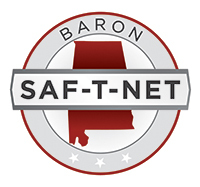 Training is scheduled from 1:00 p.m. to 4:00 p.m. and is held at the Elmore County Emergency Operations Center (EOC) Facility in the Media/Training Room. Haynes Ambulance Service provides the training. 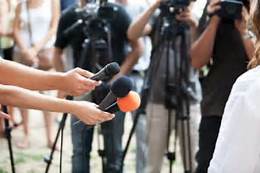 Do you want to be prepared when all eyes are on you as the spokesperson for your organization? FEMA _G-290: Basic Public Information Officer Course (14 hours) –This is a 2 day course that will be taught on February 7th and 8th and class will begin each day at 8:30 a.m. and conclude around 4:30 p.m. each day. The Basic Public Information Officer Course (G-290) is designed to provide participants with the opportunity to start applying basic concepts underlying the Public Information Officer (PIO) role. This course can provide a basic understanding of the PIO function for those new to the position. Public information consists of the processes, procedures and systems to communicate timely, accurate and accessible information to affected audiences. Armed with good information, people are empowered to make better decisions and thus contribute to the overall response goal of saving lives and protecting property. Personnel tasked with gathering, verifying, coordinating and disseminating public information at the federal, state, tribal, local and territorial levels bear this considerable responsibility concurrently with other job assignments. These Public Information Officers (PIOs) must be provided with the opportunity to learn and practice the skills they will use on the job. This is the second course in the Public Information Training Series. This course is delivered at the state, local, tribal and territorial governments. Other courses are conducted as resident courses at the Emergency Management Institute (EMI). The courses build on each other enhancing students skills further at each level. This course uses Bloom’s Taxonomy as a guide to focus the course material to augment the knowledge and comprehension for new PIOs. This course will consider the value of communication before, during and after an incident. It will help PIOs identify critical audiences, both internal and external. Selection Criteria: The primary audience for this training is individuals who have public information responsibilities as their main job or as an auxiliary function at the federal, state, local, tribal or territorial level of government, and in the private and nongovernmental sectors. Call Elmore County EMA at 334-567-6451 for more information! For more information contact Pam Cook at 205-280-2418 or visit the AEMA Training page by clicking the link below. As part of the FEMA Emergency Management Institute. There is an “Independent Study Program” where hundreds of courses are offered on-line. The National Incident Management System (NIMS) training program lays out a conceptual framework that maintains a systematic process for the development of training courses and personnel qualifications. This process produces trained and qualified emergency management personnel. The framework facilitates the systematic development of these courses and qualifications by translating functional capabilities into positions, core competencies, training and personnel qualifications. The NIMS Training Program sets a sequence of goals, objectives, and action items for the National Integration Center (NIC), which administers NIMS training nationally, and stakeholders, who run their respective NIMS training and education programs.